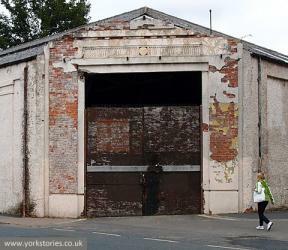 For the most recent information on this building see all pages tagged ‘Airspeed’. The Press reported: Airspeed 1930s Experience planned for Reynard’s Garage building in Piccadilly. Whether this plan can come to fruition appears to depend on City of York Council accepting the offer. The building was put on the market earlier this year. Back in 2011 I included a page on the Yorkshire Air Museum’s plans for the building, which at that time didn’t seem to be getting much support from City of York Council. It’s to be hoped they get more support now, as the council decides which bid to accept. Back in 2011 I was also given permission to include the draft brochure produced by the Yorkshire Air Museum. I assume this is the document Ian Reed is pictured holding in the photo on the Press story. Airspeed, a 1930s adventure (PDF) is © Yorkshire Air Museum.